Ashton Woods Homes announces an additional, modern feature in its Atlanta new homes: WiFi. Now providing new homebuyers with in-wall, pre-wired WiFi in all new homes built after June 1, 2012, the builder promises high-speed wireless that offers excellent range and an expanded coverage area for all usage of smartphones, tablets, laptops and other wireless-enabled devices. Integrated with the latest wireless technology, the systems installed in Ashton Woods Homes’ new homes will provide high-performance functionality for flexible wireless connection that allows any computer and wireless-enabled network client (including smartphones and tablet computers) to connect without additional cabling. Homeowners can purchase service through their preferred internet provider. Now, homeowners don’t have to deal with wires because the Wireless Access Point will be mounted in the ceilings and walls of new homes. With an unobtrusive appearance, the Wireless Access Point will blend in easily with any home and will be similar to an in-wall speaker or smoke detector. 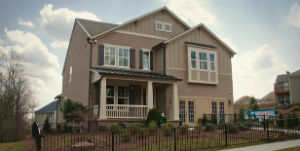 Ashton Woods Homes has more than twenty new home communities in the most sought-after locations across metro Atlanta.